Timeline: Old faithful. This section of the timeline goes by rather quickly. I would work on making sure they are getting the words. It's easy to mush them together. A visual would be great. These are really unknown words to most and a visual would make sense of these words. 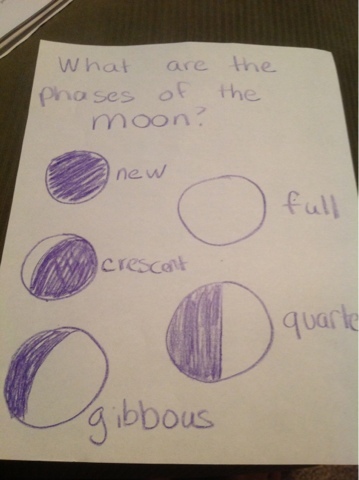 I will have the kids draw five circles and color one in fully for new, all but a banana-ish portion for crescent, half for quarter (which will probably confuse the kids:), a fat banana-ish portion for gibbous, and nothing for full. I will make mine in advance to be the example. This pic I posted also talks about waxing and waning, but I'm working with 1st and 2nd graders and that's just too much info, and it's not required. SIMPLE, Ari, keep it simple. History: I thought this would be one we could act out. After singing it a couple times and showing the visual from CC. I'll tape a paper V onto person's shirt with masking tape to be Vladimir. He will carry a Cross (or simpler still, a Bible) to the map of Russia. Another student will have a taped on I for Ivan and they'll use blocks or a hammer to show they are building the Kremlin. A student with a taped on C for Catherine will have a paper with the word "Russia" on the middle third. C will open up the other two sides of the paper to represent expansion. Math: Squares. I plan to bring worksheets with 15 square shapes printed on them. The kids can write in the numbers and we'll sing several times. English: I tried looking for a song or rap, since that last one was so much fun. No luck. I think we'll just chant and use some actions. Point to the space in front of them for "this". Point to something across the room for "that". Act like you are carrying a bundle for "these". Sweep your hand in front of you for "those" as if pointing to multiple items. Latin: we'll do the puzzle thing again. I think someone should comment to me on if you do some creative and fun things with latin. My brain seems to be stuck. Review Game: Guess what time it is!! Battleship time. Or this time I could do it Jeopardy style. Instead of avoiding the hidden x's, we'll try to get the extra points. Kinda funny that I'm not techy- my husband works with a bunch of techs, and programmers. I'm trying to figure some things out on this blog, and may have to go into hubby's work to have someone school me. I know this may be late, but for Grammar we did the chant from "Mandy" from http://www.andherewegomama.com. She is amazing. Well..you all are amazing. Thank you for sharing all of your work. You make tutoring that much easier for me. It goes like this. "This, That These those, These are those demonstrative pros". I held up a "T" shaped paper with each pronoun in it while pointing to the words and chanting. Kids love it. thank you Donna, for your kind words. Handy tips too! and here we go is such a great blog.